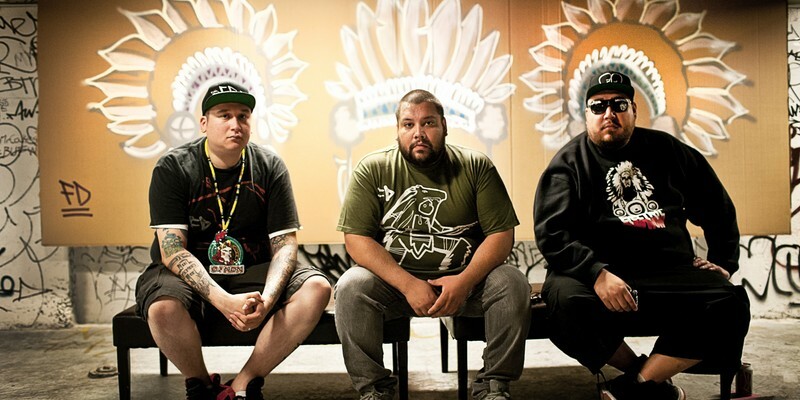 A Tribe Called Red are a Canadian electronic music group, who blend instrumental hip hop, reggae, moombahton and dubstep-influenced dance music with elements of First Nations music, particularly vocal chanting and drumming. Based in Ottawa, Ontario, the group consists of three DJs: Ian "DJ NDN" Campeau (of the Nipissing First Nation), Tim "2oolman" Hill (Mohawk, of the Six Nations of the Grand River), and Bear Witness (of the Cayuga First Nation). Former member Dan "DJ Shub" General left the band for personal reasons in spring 2014, and was replaced by Hill. The group's music has been described as "powwow-step", a style of contemporary powwow music for urban First Nations in the dance club scene; popularized by the media as a description of the band's unique style, the term originated as the title of one of the band's own earliest singles.